On February 4th, twenty-three mushers and their teams of super-athletes, including Dave and the Dalton Gang, set off for Whitehorse on a clear, crisp afternoon. Eleven days, four hours and three minutes later, Dave Dalton crossed the finish line for the seventeenth time in his twenty-second Yukon Quest. The weather at the end was considerably warmer, which accounted for softer snow and subsequently, slower times. Still, the Gang finished in the money at tenth place. More importantly, Dave finished the race with twelve dogs, the most of any top ten finisher. Only Sheldon and Grumpy failed to make it across. Congratulations to the winner of the 2012 Yukon Quest, Hugh Neff! In what was the closest finish ever in the Quest, Hugh narrowly beat Allen Moore by 28 seconds to capture his first YQ crown. Lance Mackey was third, with Jake Berkowitz and Brent Sass rounding out the top five. As of this writing Dave and the Gang are thirty miles from the finish line, holding comfortably onto the tenth spot, four hours ahead of the next nearest musher. Congratulations, Dave and congratulations to handlers Lee Lowery and Nina Schwinghammer, for helping him to Whitehorse. Dave will finish with twelve dogs, the most of any of the top ten racers. It was a well run race and all who took part should be proud of their accomplishment! Way to go Dave! The top leaders have left Braeburn and are on their way to the finish line. Allen Moore is leading the way followed closely by Hugh Neff and Lance Mackey. Expect the winner of the 2012 Yukon Quest to be decided in the early morning hours. The Dalton Gang is still holding it’s place among the top ten as the are making their way into the Braeburn checkpoint. Dave should make it there sometime Tuesday afternoon. After a mandatory eight hour layover, he’ll be on his final stretch. Good luck, Dave! Monday morning, and the leaders are approaching Braeburn, the final checkpoint, for a mandatory 8 hour rest, and then the 100 mile run to the finish line. While positions are still a bit fuzzy, its most likely down to a two-team race: Allen Moore and Hugh Neff. The two left the Carmacks Checkpoint minutes apart, and would presumably keep each other within range. However, Hugh will serve a 30-minute penalty for losing his axe, so he will leave start the final leg of the race behind Allen, in all likelihood. Lance Mackey is running a young team, and while he does get the best out of his teams, he has been losing time on the frontrunners in the last couple of days, and was last reported 3 hours behind. Does he have the “Mackey Magic” in him? The sprint to the finish will be as exciting as always! Jake Berkowitz is 6 hours behind the leaders, and needs 3 hours to overtake Lance for 3rd. Jake should take Rookie of the Year. Brent Sass looks to have a lock on 4th place. Sonny Lindner, winner of the first-ever Quest in 1984, and 24-year-old Norwegian rookie Joar Leifseth Ulsom are still contesting 6th place. Abbie West and Kristy Berington are making good time, Dave Dalton is in Pelly Crossing, with Kyla Durham on the way. Gus Guenther,Trent Herbst, Paige Drobny, Yuka Honda, Brian Wilmshurst and Misha Pedersen have left Dawson for the second half of their race. Marcelle Fressineau will leave in a few hours, with Russian Michael Telpin able to leave later this evening. The distance between Dawson City and Pelly Crossing, the next checkpoint, is the longest distance between checkpoints of any dog sled race in the world – 201 miles (323km). It is during this formidable stretch that mushers can gain or lose time. The Dalton Gang is taking full advantage of it and making their move. Dave is now listed (depending on the source) anywhere between seventh and ninth. Excitement, thy name is Yukon Quest. Go Dave, GO! Dave and the Dalton Gang left Dawson City this morning at 5:24am, exactly on time. The second half of the race has now begun and it promises to pick up speed from this point on as the trails are better groomed and the mushers can sense the finish. Dave is currently in tenth place and he must make his move soon if he is to improve his standing. Good luck, Dave! 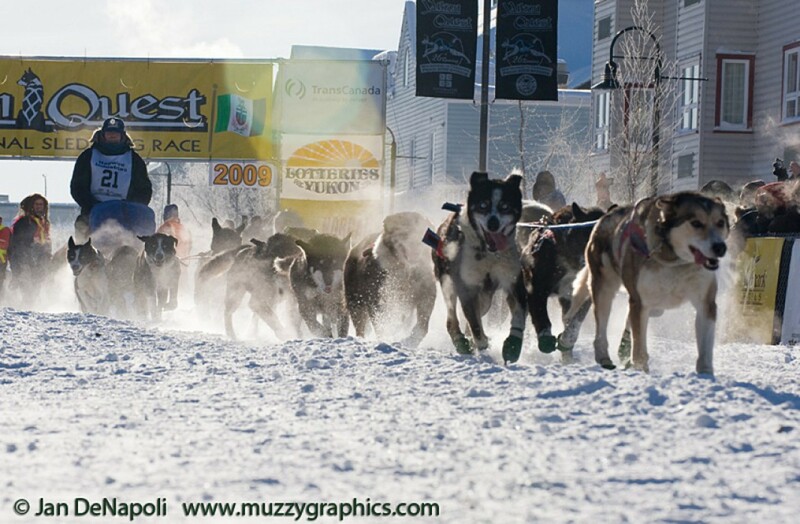 Everyone knows the musher’s job: To get a healthy, happy dog team across the finish line. But what about the support teams that follow along? In the Yukon Quest, unlike in the Iditarod, mushers are permitted to have a handler (or several handlers) moving from checkpoint to checkpoint in the dog truck. The rules allow them to help out in several very specific ways. One of Kristy Berington’s handlers, Leon Mensch, took a few minutes out from his duties to sit down with the Quest team and explain what, exactly, a handler does. Handlers visit every checkpoint with road access – from Two Rivers, Mile 101, Central and Circle, on the Alaska side, to Dawson City, Pelly Crossing, Carmacks and Braeburn on the Yukon side. In most of those places, the routine is the same: The handler drives to the checkpoint and waits for the musher to arrive. They scout out the locations of water, fuel, food – all the things the musher will need to care for their team. They’re permitted to help the musher lead the team to their campsite in the dog yard, and then they stand back and wait. They’re not allowed to be in the dog yard at the same time as the musher. “Most of the time it’s just watching her from a distance,” says Mensch.